This swing gate bollard features 90 degree turning and locking increments using a 3/4" Dia. bent pin with provisions for a padlock. 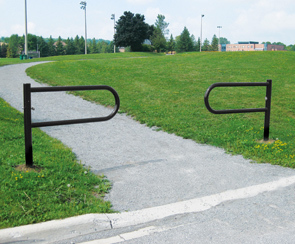 Perfect for park or trail entrances where vehicle traffic is prohibited. Gate can be unlocked and swung open to allow authorized motor vehicles. Mounts into the ground for safety. Padlock not included. The state of the art finishing process used on the bollard combines the application of an 'Electrocoat Zinc Rich Primer' with a durable polyester powder-coat top layer to ensure every crevice and joint is completely sealed, providing full protection against	corrosion and weathering. Bollards are finished in either a gloss or textured polyester powder-coat finish.